Most overseas Malaysians (I think) crave for their cheap, tasty - but unhealthy - local food every so often. And Malaysians in general, associate food as being a huge part of their culture. So really this comes as a surprise, more so that it didn't attract a lot of public backlash. 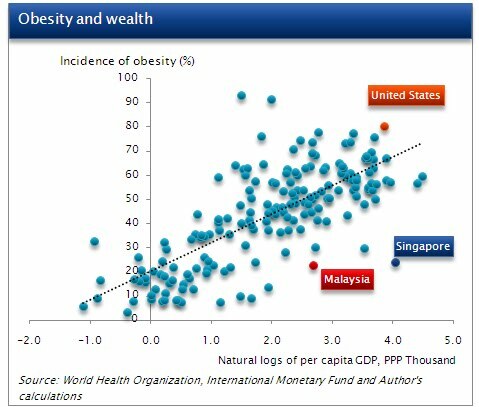 Anyhow a quick check of the stats in the World Health Organization website suggests that Malaysians aren't really that overweight in comparison. And before anyone asks...yes, you can find the highest concentration of fat people in the United States (after the Pacific Islanders).... 4 out of 5 male Americans are obese! But lets test the old Chinese adage where a wider wasteline is a sign of prosperity. This of course means digging through wealth and obesity data. It seems like Malaysia and Singapore - even with the easy access to tasty, greasy food are below the global trend. This of course begs the next question - what do you do with the kids who actually 'fail' (is there a fail mark) in the BMI? Oh, I can think of other (just as good) reasons to get rid of the sugar subsidies other than this, but more on that later. i say....lean for longevity. healthy workforce for long-run growth prospects and less burden on public health budgets.